Happy Thanksgiving everybody! I’m going to spend it eating pavlova (because that’s what Australians do) and hopefully sneaking in a bit of sewing. I might even get started on a little challenge that I’ve set for myself. I’m putting it out there right now, mostly to say it out loud, and partly, to see if there are any other crazies out there who would like to embark on this skill-up journey with me. If you’ve read the title of this blog, it sounds rather ominous, but actually, I think it will be quite achievable. I just need to commit. To give you a little background to this challenge, I’ve been in the process of making myself a winter coat. Those of you who follow me on Instagram may have seen my progess. I’m using a gorgeous tufty wool coating and traditional tailoring methods which is a learning experience in itself. I’ve made a few coats before (here, here, and here). I’ve always been delighted with the way they turned out and each was an improvement on the next, but I’ve still got a long way to go. I feel like I’m finally starting to get my head around the construction and reasoning behind the inner structure with this coat, but there’s one area of coatmaking that has always been a stumbling block for me. Buttonholes! Now, bound buttonholes are delightful, and not actually that difficult to do. But not every fabric is suitable for bound buttonholes (I found that out with my last coat). Machine buttonholes are not the end of the world, but I’m not overly excited with the keyhole option on my machine. I’ve considered hand-worked buttonholes on more than one occasion, however my efforts have been so disappointing that the option was quickly ruled out. I really hate the feeling of being restricted in my choice of design because of a skill I’m lacking, particularly something that simply requires practice. I want to equip myself with the ability to produce a beautiful buttonhole when and if I want. Can you imagine the sewing possibilities… blazers, pants, and coats of course. The key to this magic skill is of course practice. I’ve heard it said that it takes 100 buttonholes until you become proficient at a technique. This may be a bit extreme, but it is exactly what I intend to do. I’m giving myself a year and a month. That gives me a week to organise the correct supplies for hand-worked buttonholes, and a starting date in December. At the moment, I spend a quite a few hours each week “watching” kids at various sports. If I put away my phone and practiced buttonholes instead, it would be a much better use of my hands and time. If I only get two done a week, I’ll be on track to completing this project. For the most part, I’ll be documenting my buttonholes on Instagram ( #100buttonholeschallenge ). You might also see an update or two on this blog, and possibly a tutorial or sewing tips in the future. I’m certainly hoping I can do better than this blurry 2012 attempt. This entry was posted in Uncategorized and tagged #100buttonholeschallenge, buttonholes, coatmaking, tailoring on November 25, 2015 by Debbie Iles. I too am making a winter coat and the fabric doesn’t lend itself to bound buttonholes. So I plan on making hand worked ones. Like you, my buttonholes don’t look great. I could take the coat to a Chinese tailor here in town who does handworked buttonholes, but I kind of want to do them myself. As you say, practise makes perfect. Ugh, you’re made of stronger stuff than me – I did hand sewn buttonholes on a man’s jacket a few years ago and I HATED it. Good luck beating them! This sounds like a great think to do. I’d love to perfect hand worked buttonholes. Will see how I go joining you. I spent years ‘watching’ kids sport, if only I was sewing back then!! I read somewhere long ago, that one cheater way to make these buttonholes is to make a machine worked one first. 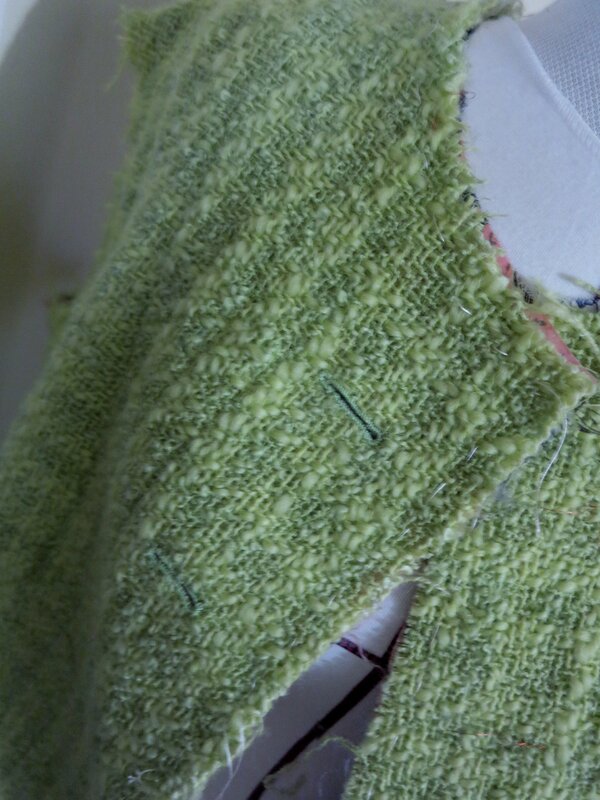 Then go over that with the buttonhole stitch. I tried a couple yesterday, changing the stitch length on the buttonhole so that it wasn’t too dense. It does give one a good line to follow and helps to keep the hand-worked stitched the same length. Julie, that is such a good idea. I might try this on the coat I’m working on.